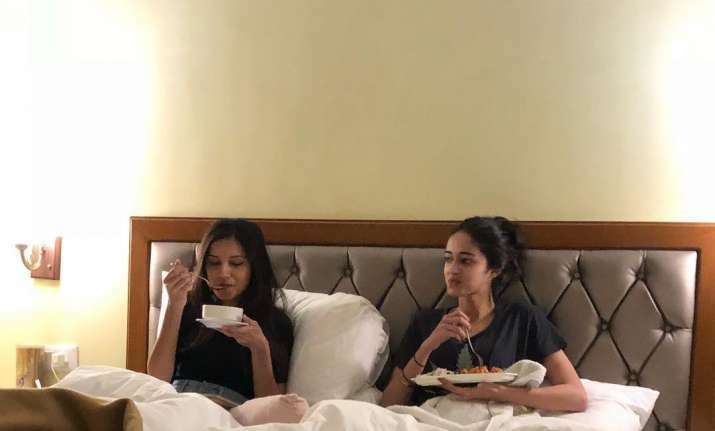 SOTY 2: After cuddling in cold, Ananya Panday and Tara Sutaria are now dining together. BFF goals, indeed! Ananya Panday and Tara Sutaria are new BFF goals in Bollywood. Last week, Ananya Panday and Tara Sutari, the two budding actresses of Student Of The Year 2, took the internet by storm with one picture. They were captured cuddling by Punit Malhotra in Dehradun weather. Now, the actresses are seen enjoying a sumptuous dinner together. Malhotra again caught them off-guard in their hotel room. He posted the picture on her social media, in which Tara and Ananya were seen getting chatty over dinner. Here’s how Ananya Panday is bonding with co-star Tara Sutaria on Student Of The Year 2 sets! Tara Sutaria also dropped a comment on the picture. She wrote, “WHY”. The meaning of their conversation is unknown yet. Only the team of Student Of The Year 2 knows what they’re talking about in these cryptic series of pictures and comments. However, the pictures are cute in every sense to go viral on the social media. A couple of days ago, Ananya Panday and Tara Sutaria were seen cuddling in the cold. Both Ananya Panday and Tara Sutaria are making a debut in the industry with Karan Johar’s Student Of The Year 2. Apart from the actresses, Tiger Shroff will also be featuring in the film in the lead role. The film is already on the floors now, with the commencement of shooting last month. We hope this fresh pairing of the budding actresses will cast a magical spell at the box office. For this, we’ll have to wait for the film to release. Meanwhile, let’s wait for some more updates from the sets of the film in Dehradun.